While the United States remains a major global supplier of wheat, it has struggled to attract new markets and has seen its export totals decline over the last decade. U.S. wheat exports have decreased as Russia, Ukraine, and the European Union (EU) have gained market share in several key U.S. markets. 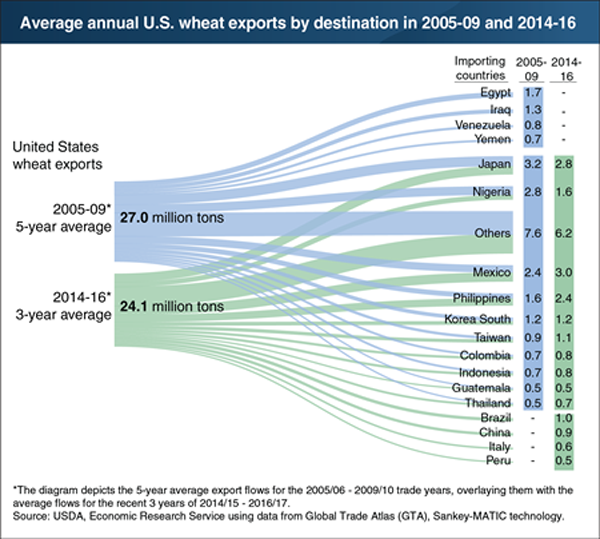 Although the United States has retained and even increased its wheat exports to some of its markets, such as Mexico and the Philippines, export volumes to several other markets have contracted. In one striking example, Egypt, one of the world�s top wheat importers, formerly purchased the bulk of its wheat from the United States but now receives most of its imports from Russia, Ukraine, and the EU. A similar shift is happening with Nigeria and Yemen. Much of the growth in U.S-displacing wheat exports from Russia and Ukraine is in low-quality milling wheat (for food consumption) and feed grain. This Chart of Note originally was published October 17, 2018, and is among our Editors' Picks 2018.